While Joey is currently consumed by the thought of replacing a large percentage of our randomly yellow grass with large beds of water-wise plants (i.e. xeriscaping), I am experiencing some kind of weird devious urge to grow plants. Not only grow them… The actual urge is to grow plants from seeds or pits, and bonsai them. I think it all started a few weeks ago, when I had to hard-prune Bonzie (my 5-year-old Ming Aralia bonsai) because an irresponsible delayed watering had left him with dying foliage. This is the second time I really screw it up with the poor thing, and although he survived the first time, I wasn’t sure he’d make it trough this new episode of hardship. To top it off, Juno (our baby Juniper bonsai) had also been neglected a few days. His leaves turned dull green and became extremely sharp to the touch. So, the whole thing prompted me to search the internet for bonsai resources. According to the internet, you can bonsai any plant… oh wait, was it any tree?, or really, any plant? I can’t remember what my brain got at the time, but the reading reminded me of old school biology experiments growing beans in water. I remember being fascinated by the quick progress of bean germination, but after a few days, the poor plant would be discarded. So I rushed to the kitchen and put three black beans in a bed of wet cotton over a glass of water. I thought: I’ll bonsai beans! Truth is that bean plants are not trees, so who knows what may happen. They are pretty though, and I could always move them to outdoor soil. While I figure that out, the beans are growing so quickly that checking on their progress every morning is fascinating to me. The payoff comes so easily that it blinds my mind into thinking I can do the same with any plant. So, I immediately thought of oranges. They are trees. They have been trained as bonsai. In fact, somebody got them to produce tiny bonsai oranges. How damn cute! Out of oranges, I collected the seeds from my lemonade at dinner. Next day, as I was snacking on some delicious cherries thinking of bonsai growing dreams, I almost didn’t realize I was eating CHERRIES, and I could also save and attempt to germinate those seeds. Would it be as easy as the water trick with beans? The internet says no way. Turns out germination of cherries from pits requires some “hibernating” time in cold temperature. There is a whole process involving your refrigerator, or better: winter, in order to get the seeds to grow. Will I attempt that? But of course! The internet does say that cherry trees grown from seed will not give fruit in less than 10 years, but what about flowers? Can I get some gorgeous cherry blossoms if I grow a home-made bonsai cherry tree? I’m not sure. Even if it takes 10 years to produce flowers, the thought of that glorious day infuses my mind with nerdiness, and I can’t help but dream and keep on going with my childish experiments. The bean plants really do give a quick payoff. I am interested to see how this all turns out!! By day 52, the bean plants have grown 3-4 rows of leaves, many of which have been attacked by tiny bugs which I’m now spraying off with water. Today, the first flower has bloomed. It’s so pretty… At least four more flowers are coming in the next days. Saddly, the first flower lasted only a day, and most of the other flower buds fell off before they could fully develop. However, one of them was able to make it, and by day 70 it has held strong enough to let us see the beginnnings of a baby bean pod. At the time I hard pruned my bonsai, I took some cuttings to attempt to root them and start a new plant –just in case I’d lose Bonzie. Today, I’m happy to report that Bonzie is fully recovered, and after 7-10 weeks, two cuttings have developed impressive roots. A new Ming Aralia has been born. 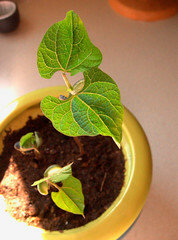 The bean plant has kept losing leaves, and by day 97 has three bean pods in development. I’m not sure of how long she’ll be able to live without leaves, so I opened one of the bean pods. Not knowing if the seed is mature enough, I’ll still attempt to germinate it and see what happens.